BURBANK, CA (December 19, 2013) -- Heck, yeah! Warner Bros. Home Entertainment (WBHE) has announced the fourth season release of The Middle , one of TV's most acclaimed comedies, on DVD. Finding laughs in the heartland, the Hecks are back to tickle everyone's funny bone with 23 hilarious episodes plus deleted scenes and a gag reel. 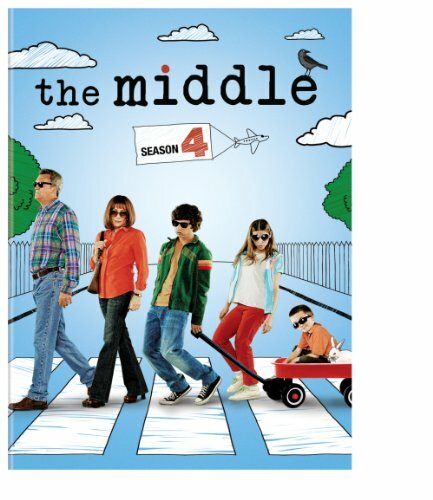 The Middle: The Complete Fourth Season will be available February 25, 2014 and will retail for $44.98 SRP. Throughout the fourth season of b>The Middle , The Hecks continue to deliver more laughs and good times straight from America's heartland. Struggling to sell cars at the only dealer left in town, an unexpected turn of events soon forces Frankie (Patricia Heaton) to reevaluate her career path. Meanwhile, Mike (Neil Flynn) has made it his mission to ensure his sloth-like son Axl (Charlie McDermott) gets a football scholarship so he can get into college next year. Sue (Eden Sher) finds herself not only navigating high school but also the roads of Indiana, if she can finally get her driver's license. With all the crazy happenings, it's no wonder youngest son Brick (Atticus Shaffer) keeps his head in a book and, as usual, whispers to himself. No matter what happens, viewers can count on this quirky and delightful family to continue to bring on the laughter and fun! b>The Middle has consistently remained a hit among television viewers, leading off ABC's Wednesday comedy block; the show's fourth season is averaging a strong 9.5 million viewers* per week. The popular series also recently launched into national syndication, airing five nights per week on local stations as well as on ABC Family. The Middle is also slated to debut on the Hallmark Channel in March 2014. Starring two-time Emmy(R) winner Patricia Heaton (Everybody Loves Raymond), Neil Flynn (Scrubs), Charlie McDermott (The Office), Eden Sher (Weeds) and Atticus Shaffer (Hancock), The Middle was created and is executive produced by Eileen Heisler & DeAnn Heline (Roseanne, Murphy Brown, How I Met Your Mother). The Middle is produced by Blackie and Blondie Productions in association with Warner Bros. Television. "b>The Middle is a truly funny series that captures the family experience with insight, humor and charm. Everyone can relate to the Hecks in some way and that's one of the reasons this series has become such a hit," said Rosemary Markson, WBHE Senior Vice President, TV and Special Interest Marketing. She added, "We're delighted to release season four of this fan-favorite on DVD."